Yesterday, sky adventurer Felix Baumgartner hurled himself out of a 30 million cubic foot helium balloon hovering at the edge of outer space and fell 24 miles down to the earth, making him the first human outside of a vehicle to break the sound barrier. What else is there to say except the man has balls of steel? 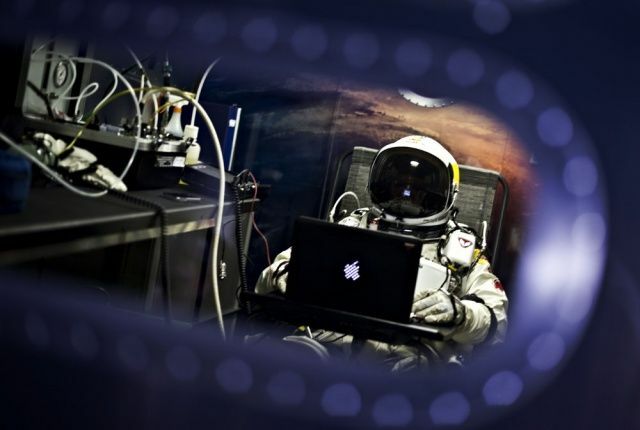 Well, maybe this: Felix Baumgartner uses a MacBook. And like everything else he does, he does it like a boss. This photograph was taken in the Red Bull Stratos Mission Control in the moments leading up to Baumgartner’s record-smashing space jump by Predrag Vuckovic and Limex Images. You can see Baumgartner’s full space jump here.